Knock Out roses are so popular because you barely need to lift a finger to enjoy all-season blooms. But pruning is one simple task you can do that makes Knock Out roses look and perform even better. These three tips give you all the information you need to prune Knock Out roses – actually, any roses – confidently. By pruning your Knock Out roses, you ensure the growth for the season comes from the thicker buds further down on the stems rather than the thin, spindly buds at the tips. The bigger the bud you cut back to, the thicker and more vigorous the growth will be. Pruning ensures lots of robust growth and hundreds of blooms. Knock Out roses can be pruned in fall, winter, or spring, but spring is ideal, especially if you aren’t very confident in your pruning skills. Why? Because when the new growth is beginning to emerge in early spring, the plant tells you where to cut -just look for the biggest buds and cut right above them. First, target any dead wood, removing it as close as possible to the main stem or to the ground. Then, take out a few of the oldest stems that aren’t putting out lots of new growth, aiming especially to open up the center of the plant for best air flow. Finally, cut back all remaining branches to just above where a big bud is emerging. You may cut back quit ea lot if you wish, or as little as a third – use your ultimate vision of the plant as your guide. That’s it! You can fertilize, if you wish, using a granular rose fertilize or general garden fertilizer. But other than that, all you have to do is start looking forward to another season of fabulous blooms. Arborvitae (pronounced ar-bor-vye-tee or ar-bor-vye-tuh) is the plant’s common name. It’s scientific name is Thuja (pronounced thoo-yuh). It’s a rare case of a plant’s common name being more complicated than its scientific one, but both have poetic meanings: arborvitae means “tree of life” in Latin, and thuja refers to a tree that was used to make fragrant incense in ancient Greece. Arborvitae is native to the US. Sometimes known as Eastern red cedar, Thuja occidentalis can be found over a huge portion of the eastern US and Canada. Its foliage is delightfully fragrant. If you have one in your yard, crush its foliage and see – it has a refreshing, fruity scent. Arborvitae have one of the fastest growth rates of all evergreens. Once they’ve developed a good root system, they can grow up to 3’ per year. That means when you plant an arborvitae hedge, you get privacy, quickly. There’s an arborvitae for every climate. If you live in chilly zones 3 and 4, opt for an Eastern arborvitae like ‘Wintergreen’ or ‘Emerald’. If you live in warm zone 8, ‘Green Giant’ is ideal. And if you live in zone 5-7, you can take your pick – any of them will do great for you! Thinking about planting a hedge this season? Now you have some fun trivia to share with friends, family and neighbors. And if you’re looking for big, ready-set-grow plants, we’ve got you covered. ‘Walker’s Low’ nepeta has been a best seller for us since day one – that’s over ten years. It’s beautiful, long blooming, deer resistant, and super easy to grow. You probably already know that, but did you know these five fun facts about this garden classic? Nepeta is its scientific/botanical name. It derives from the town of Nepete, now known as Nepi, in Italy, which is about an hour north of Rome. Its common name is catmint and it is indeed closely related to catnip. 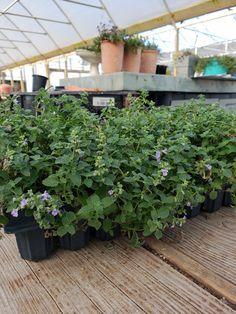 It is in the mint family, and shares some of that family’s most common characteristics: square stems, fragrant foliage, stacked leaves, and tubular flowers with a showy lip. The name ‘Walker’s Low’ does not refer to its stature – it’s actually about the same size as other popular catmints. Rather, it comes from the garden in Ireland where it was discovered, Fernhill. The owners of Fernhill were the Walkers, and this variety with its soft, silver-green foliage and long bloom time appeared by chance in their lower garden. Introduced in Europe in the 1980s, it found its way to the US in the 1990s, where its popularity grew quickly. It was awarded the prestigious Perennial Plant of the Year award in 2007. Look out the window. What do you see? Snow? Ice? Okay, besides that. Any plants out there catch your attention? If not, there should be! There are lots of perennials, shrubs, and even succulents that stick around during winter to bring a bit of interest to this otherwise dreary time. In fact, there are too many for us to list them all, so here are seven rather surprising suggestions to get you closer to a more beautiful winter next year. Hydrangeas rule the summertime, but all things considered, they’re pretty stellar in winter, too. Super-hardy panicle hydrangeas like ‘Limelight’ create an elegant scaffold for catching snowflakes, and provide shelter for birds, bringing an extra level of cheer. ‘Limelight’ can grow in sun or part shade anywhere from chilly USDA zone 3 to steamy USDA zone 9. Also known as blue fescue, Festuca glauca is an evergreen (or should we say everblue?!) ornamental grass that keeps its color and shape all winter and looks especially appealing surrounded by fluffy snow. Sprinter boxwood (Buxus microphylla‘Bulthouse’) is one of the best hardy boxwood. It stays greener in winter than other selections and naturally grows about 1.5x faster than other selections, too. An evergreen fern? YES! And tassel fern is one of the most beautiful, with highly textured leathery foliage to tide you through winter and very unique fiddleheads in spring. Shade tolerant + deer resistant! Though its bloom time is still a few weeks away, their handsome, leathery foliage makes winter much more tolerable. This plant is very resistant to deer and highly shade tolerant – a real problem solver! 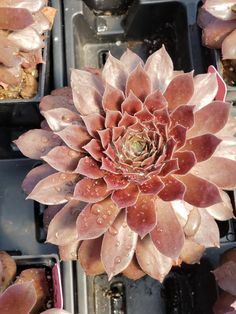 Their botanical name, Sempervivum(which translates to “always alive” in Latin) doesn’t just refer to their durability. It’s also because they’re around all winter, all the better to accent their striking geometric form. 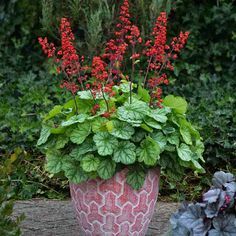 We don’t know what we like better about this plant, also known as bergenia – its pink spring flowers or its big, leathery, cabbage-like leaves in winter. Either way, we’re awfully glad to have it around come January. Sedum Plum Dazzled – an exciting new easy to grow Sedum will provide season long foliage color! Butterfly Loving Sedum that is deer and drought proof! 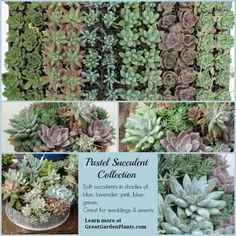 Plum Dazzled (PPAF) is a new selection of Sedum from Chris Hansen, breeder and originator of the SunSparkler Series of Sedum. 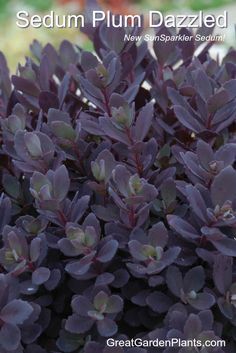 Plum Dazzled is a sport of Sedum Dazzleberry with all the same features but with plum color foliage. 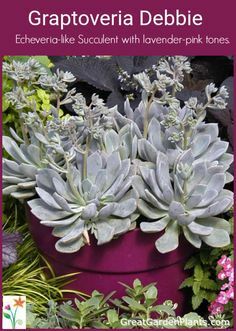 Sedum Plum Dazzled is 40% darker in color compared to Sedum Dazzleberry. 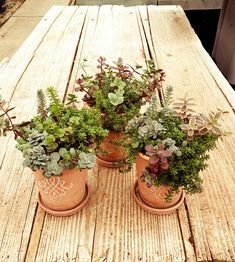 Growing Tip: Sedums will thrive in poor, but well drained soil. They need little water to do well. Plant Plum Dazzled in full sun for best color. Part shade may reduce the intensity of the color. Buy Sedum Plum Dazzled today and spice up your garden with season long color!